I’m fascinated by people and discovering who they are and what they need, underneath the surface. At IDEO, I’ve leveraged ethnographic research methods (interviews, immersions, surveys, etc.) to dig into everything from the future of cannabis to the future of computing. At Stanford, I’m employed as an adjunct lecturer and teach advanced user research methods to students every Fall. My IDEO work is client-facing and confidential, but here are examples of design research sprints I conducted as a student at Stanford. We hit “fast-forward” and imagined radically different education and learning experiences for 2025. For an experimental, year-long d.school course taught by David Kelley, 4-6 cross-disciplinary teams set out to discover the future of education and learning. Each team anchored in a different provocation—How will we find purpose and set goals 10 years from now? What if we reframed majors as “missions”? What role will professors and mentors play, and what new roles will emerge? What will resumes look like? As part of the “online/offline integration” team, I studied the tensions between on/offline learning experiences, and spaces where in-person, physical experiences still triumphed over digital ones—like Powell’s Bookstore in Oregon, where we intercepted shoppers and clerks. How might the San Jose Sharks engage and delight remote fans? We discovered how a rabbi might use longboarding as a way to give younger students the permission to connect. Curious about a sudden rise in longboarding in the Bay Area, our team set out on a 4-week sprint to understand longboarding culture and a “day in the life of a longboard.” We studied newbies, experts, haters, longboard store clerks, etc. and went to skate parks, shops, and downtown areas. We met a polished writer-artist who longboarded to class everyday but refused to identify with the longboarding community, and an expert rider who could explain every nuanced shape and curve of their customized boards. 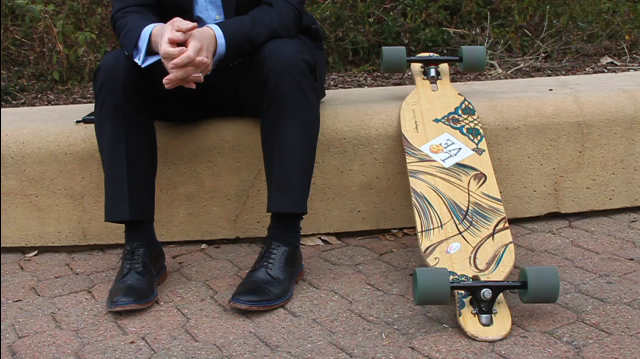 Some of our most interesting insights came from a rabbi who, we found, uses longboarding to implicitly give younger students the permission to reach out to him and perhaps get curious about religion.